In the renal parenchyma, halfway between the intralobular and interlobular veins run the intralobular arteries (aa. intralobulares). After passing the glomeruli, the intralobular arteries together with the interlobular veins empty into a cortical peritubular capillary network (rete capillare peritubulare corticale), that ramifies between the cortical glomeruli and the convoluted tubules (tubuli convoluti) of the nephrons, thus forming portal-arterial anastomoses. Blood from the cortical capillary network drains into the central intralobular veins. 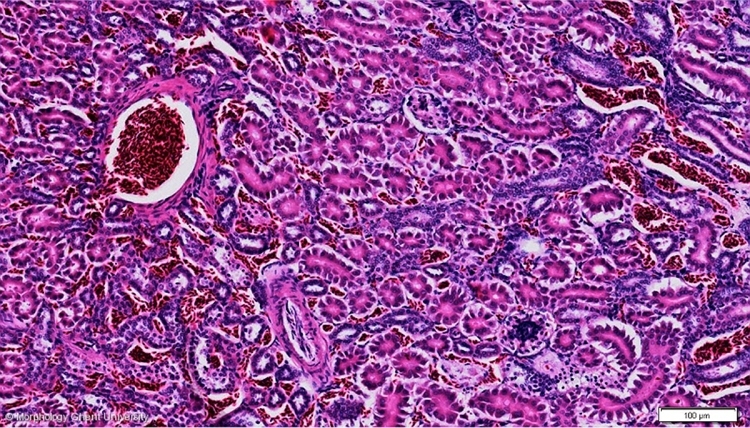 The medullary capillary network (rete capillare glomerulare), as in mammals, is derived from the vasa rectae.